Freed-Hardeman students are focused on impacting the world through excellence and service. Peyton Manning’s dedication and determination have led to phenomenal achievements in the classroom, college sports, the NFL and community. Recently retired from the Denver Broncos, Manning is a 14-time Pro Bowl selection and the NFL’s only five-time Most Valuable Player. He is the active leader in nearly every statistical passing category. Manning notched two Super Bowl victories in four appearances. In 2007, the Indianapolis Colts defeated the Chicago Bears, 29-17, and this year, the Denver Broncos beat the Carolina Panthers, 24-10. As a quarterback at the University of Tennessee, Manning epitomized the term student-athlete. He claimed 43 records at the school, conference and national levels, while graduating with Phi Beta Kappa honors. He led the Vols to an SEC championship as a senior in 1997 and earned consensus All-America honors. He received the Sullivan Award for the nation’s top amateur athlete based on character, leadership, athletic ability and the ideals of amateurism. Off the field, Manning was honored as the recipient of the Byron “Whizzer” White Humanitarian Award and the NFL’s Walter Payton Man of the Year in 2005, as well as the Bart Starr Award in 2015. He is a member of the American Red Cross National Celebrity Cabinet and The Pat Summit Foundation Advisory Board. He and his wife, Ashley, established the PeyBack Foundation, which has provided more than $10 million to assist programs offering leadership and growth opportunities for at-risk children. Manning maintains a strong relationship with St. Vincent Children’s Hospital in Indianapolis; it has been renamed the Peyton Manning Children’s Hospital at St. Vincent in his honor. “Freed-Hardeman students are focused on impacting the world through excellence and service. Peyton Manning’s dedication and determination have led to phenomenal achievements in the classroom, college sports, the NFL and community. We hope his message will encourage not only our students as they serve but also everyone who hears it," Wiley said. 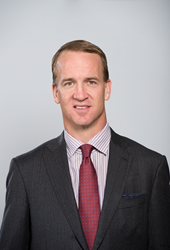 Peyton Manning is the son of famed quarterback Archie Manning, who spoke at the FHU Benefit Dinner in 1995. Father and son combined their talents for a 1999 appearance at FHU’s Sports Advisory Council Dinner. Sponsorships begin at $600. To learn more about purchasing tickets or becoming a sponsor, individuals may visit http://fhu.edu/manning. Forever Communications is the premier media sponsor for the event. General admission tickets will go on sale Oct. 1, pending availability. The mission of Freed-Hardeman University is to help students develop their God-given talents for His glory by empowering them with an education that integrates Christian faith, scholarship and service. With locations in Henderson, Memphis and Dickson, FHU offers bachelor’s, master’s, specialist’s and doctoral degrees. More information is available at http://www.fhu.edu.